Mum went shopping and found us another Halloween kittie, Black Witch Kittie. Sings a new song! 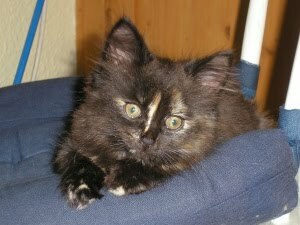 You can go back to last year to see our Black Majic Kittie. Here is a link to our HalloWeenie card. (we got the link fixed ). Hope you like it, our Uncle Stormie sent it to us. We will be hiding this evening while mum hands out candy to little sticky people, who will get stickier with the candy. We had a huge windstorm here for the past couple of days. Nothing happened here, other than leaves blowing around. All of the trees are OK and didn't lose any branches or limbs. Nothing of our blew away. So we have just been hanging out together, mum, Ducky and me. Otherwise things are pretty much as usual lately. Mum has the baseyball game on, but just for background noise. I think it is time for her to read us more of Dewey's new book. It has nine stories about cats and their beans, with some extra Dewey stories. Weekend is almost here. We have a few parties to hit. BillySweetFeets is having a dance party Friday and Gracie is having a Halloween bash on Sunday. Hope to see you there, should be a good weekend. My little sweetie Dora is in training to be a lap kittie. I already am a lap kittie, here I am actually sitting on mum's legs with the blankie to help keep her warm. Someting Dora and I have in common. Her mum thinks she is a bit too young to have a gentlemancat caller but we are allowed to play together. So I will just wait a bit until she gets older. We were super nice to mum this weekend, we let her sleep for a full 10 hours in a row! She says she doesn't remember sleeping for that long in ages! We know she needed it, too many late nights and worries about Grampie. We thank you for all of your continuing purrs and prayers. We didn't do much this weekend anyway. The furnace tuneup guy came and went, mum watched Bucky Badger feetsball with Grampie on Caturday afternoon. Mum did washing, foods shopping and finished reading her book. Mum didn't even watch any of the feetsball games early in the day on Sunday. Saved herself for Sunday Night! The Pack beat old Grampa Brett and the ViQueens on Sunday evening. They had Grampa limping pretty bad by then end of the evening and Grampa kept tossing the ball to the wrong team. But mum says he is known for tossing that old feetsball to the opposition. And she came home from the library with this for us to read too! Wow, thanks to all who stoppped by for my purrthday party. We did have a great time. I think I finallly managed to get around to all of the your blogs by yesterday to see tock pictures and thank you for stopping in. We have been napping lots recovering, I think a few kitties stayed over for a day to nap off the party as mum says she thought there were a few extra balls of floof around on Thursday. Oh we forgot to post Ducky's tock shot too! Uncle Flip is gone for now, just here to see how Grampie is doing now. Both he and mum are sad, but hope that he gets his wish to go to heaven soon. Warning, my Uncle Flip is visiting, so if you smell woofies it is just him. Pay him no mind, I put a spell on him, he can't see us! Above is my shelter mug shot, helped mum to start to fall in love with me. Then she visited and I captured her heart. Hey everyone, stick around and visit. The buffet is out and the bar is open! Turkey, chick-hen and of course lots of ham! Lots of milk and tuna juice for the kittens! The good stuff for us adult kitties. Champagne, Meowgarita's, Singapurrsling's and Blue Tuna Gizzy's. Can't miss the treats, these are neat little cakes with treats and nip baked inside! Today I am now 7 years old, but I am still a feisty, sassy cat. Chasing Ducky around, wrasslin' and just having fun. Oh yeah, a new tocks picture too! Mum was gonna try to cook, I wanted to snoopervise! Hiya, Ducky here. Thanks for your purrs for both Grampie and Mum. Mum says he has behaved himself the past few days, although he has a pretty nasty black eye in addition to his stitches. Mum however has the sniffie, sneezy, scratchy throat stuff. Has been drinking lots of fluids and going to bed early. She did visit Grampie a little bit on both Caturday and Sunday. Watched the first half of the Packer game, then Grampie wanted a nap! So mum came home. The Pack - Lost in overtime for the second consecutive week. They play Grampa Brett next Sunday night. Grampa Brett and The ViQueens - They beat them Cowboys. The Colts - Playing on Sunday evening, mum says she will not be staying up to watch the whole game. She needs her rest. 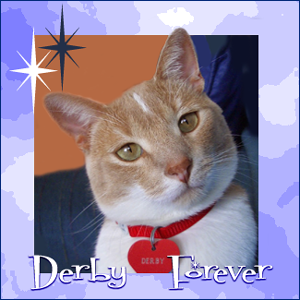 Stop by on Wednesday for Derby's Purrthay Party and cellybrate TockToberFest. The two of us and mum are very happy the weekend is here. Mum had a heck of a week with Grampie. Seems he doesn't want to ask for help when he should or is supposed to. So mum got a call in the middle of the night, then got dressed and left us alone for hours. She need to go check on him as he need to go to the ER in the middle of the night for stitches. So then mum got home and then like left for work, came home early from work, took a nap and then left us again for hours. Sheesh, we love Grampie but us kitties need attention too. Yeah, mum says we need to purr for him, but we miss you mum not being here, specially in the middle of the night. We like to sleep on you, specially Ducky. Speaking of Ducky, no word yet from Dora or her mum. At least he got his ask in, now he just has to wait. See the picture above, it is our new profile picture. Mum got a good picture of us both together. Yeah, I guess we like each other. Hiya, Ducky here. 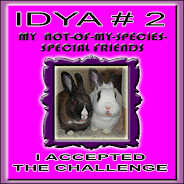 While I have been around the cat blogoshpere for a while I have managed to stay unattached from any specific girl cat. Well, no longer. I left the following message for little Dora, who has come to live where Fat Eric used to live. Miss Kate I have a question for you. 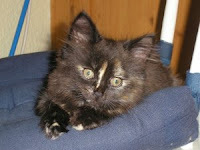 I know little Dora is still a kitten, but I am falling in love with her. When she gets old enough, I would like her to be my girlfriendcat. With your purrmission of course. I sure hope she and her mum say yes! Hope everyone had a great weekend. We continued to have wonderful weather and open windows. Here you can see the heat meter reading nearly 80 on Friday. Mr Chippy running around looking for foods to hide in his winter den. He has been scurrying all over the place for days. Even though we had nice weather on Caturday, mum was very good and worked more on sorting through boxes and the filing cabinet. She was even able to muscle the filing cabinet into where it is going to stay for now. Plus now she can get back into the closet in that room. Mum says some of the fluffies will have to go, she just doesn't want to take up the bed space with them. That basket is full of fluffies which takes up a lot of room. 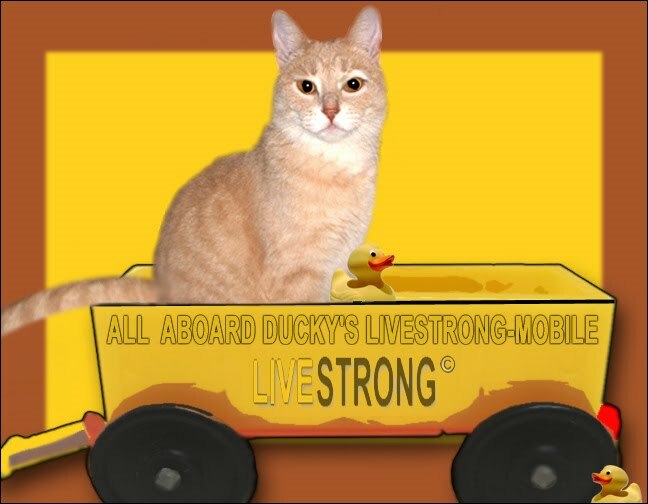 Hey, this is a blog for kitties, me and Ducky. Where is our pictures!? Yeah, here is Ducky, he had mum all freaked on on Caturday evening. He wasn't around and mum couldn't find him for a while. She finally opened her sleepy room closet and he wandered out. He sneaked in there while she was putting her clothes away. Me, just chilling on the back of the couch, keeping an eye on mum and Ducky. Grampa Brett and the ViQueens - Play the Jets on Monday night. We had a mum day today! We didn't expect it. Mum left the house the same time as always this morning, but when she came back, not that much later, there were two guys and a truck with her. Mum came in and put us in here sleepy spot and shut the door. When she opened it up again this is what we found in the empty room we had to wrassle in. Another big big bed to sleep on and mum says she is happy the head board won't block the window. Other pieces were along the other wall. Mum started to get them pretty and I jumped up to check them out. Bed getting made up, mum says now she has room for both Uncles Flip and Stormy to have beds if they are here at the same time. Ducky getting into the act, see that cute stuffed thing. Mum says her Grammie made it and she has one and Grampie has one too. Three D quilting. The stuff in place now, mum says just only minor tweaking going forward. Bed all made up, mum even added a few fluffies to the bed after we took off. Mum took advantage of the really nice weather and having the day off. First she opened lots of windows for us. She sat outside on the patio, first time in ages, read a book and sip a drink. Just chilled out for the afternoon. Then she got the fire grill going and fixed dinner outside. We got chick-hen tonight from the grill. It is going to continue to be nice over the weekend, which means mum can open windows for us again. Whoohoo. This is how our waterfall has looked in the past, water flowing nicely, green trees and bushes. They took the water away several months ago to do an inspection and fix things if they needed fixing. Then when we had our flooding back in July, mum took a video you can see here. Mum stopped back a week or two ago and still no water, but all of the green stuff is gone too. Mum said they took the trees and bushes down since they weren't supposed to be there. Some of the stuff growing was not native to Whiskerconsin. Here is a video of the waterfall now, mum thinks they replaced the concrete/cement where the flood gates were, they did take the flood gates out. Also, if you look close at the start of the video you will see some beans. While mum was there they went round the protective fence and were climbing out on the dam! Mum was nearby and said they should get off, they shouldn't be out there. They got mad at her, mum didn't care, she thought they were stupid, had gone by all of the warning signs. They did get off but mum was prepared to call the cops if they hadn't. 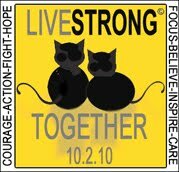 I forgot to give Zoolatry the credit for the nice LiveStrong graphic from Saturday. Thanks guys you are the bestest. Yeah, lots of drama around our house this weekend. Mum started bring in boxes of stuff again on Caturday. Then she started moving the furniture around! We had to be careful not to get stepped on 'cuz she wasn't paying much attention to us. 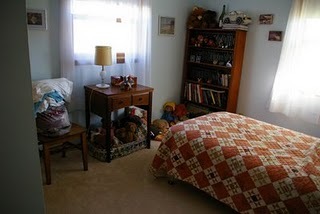 This is what our guest room has normally looked like. A little bed for us to nap on, the bears and other fluffies to nap with. The bed is gone! But that makes more room for us to wrassle on the floor. All the stuff is gone except for the bookcase and the little bedside table, which got moved from the other side of the room. Derby sitting in the hall on the chair snoopervising mum moving stuff from one room to another, 'cuz this stuff had to go somewhere. The other room where mum put most of Grampies stuff, this is from back in early July shortly after all of the stuff got here. This is the room now, the little bed and fluffies have moved in here. Plus lots of other stuff piled up in the corner, mum has had to move stuff out of this room to get this stuff in the room. Mum didn't take any other pictures but the living room has some of the stuff in it and so does the dining room. She said Friday things will change again, but it will give us more places to nap! Can't wait for that. Here is some video that mum shot months ago. We can tell 'cuz none of Grampies's stuff is in the room. Mum needs to learn to hold the video thing steady when she walks around. You could get sea sick otherwise. The Pack - Hung on to beat the Lions! Mum watched the game with Grampie at his place. The Colts - Got beat in the last seconds by a field goal to break a tie by the Jaguars. Grampie update - it has been decided that he will be staying at the rehab place but moving up to second floor which mum calls the nursing home. He needs to be monitored since his lungs aren't going to work as well as they should anymore. He will need oxygen from here on, but Sunday he was about as good as mum has seen him. He understands that he needs to be here from now on and isn't as confuzzled. Yep that is what we do, we are stronger together. Beans and kitties both get cancer, together we can beat this nasty disease. So get on the wagon, The Ducky Wagon, and support cancer reasearh. Support your furiends or family if they have to deal with this. Drive people to their appointments, hold their hand, make them dinner, just be there. Hope and support, we all need it. We made mum get out her plastic money thing to support our blogging buddies mums who are walking like forever this weekend out on the left coast. So Max & Buddah's mum, Skeezix's mum, Jeter Harris's mum and the divine Diva Kittie, Sophia's mum DKM. We salute you for walking, raising money and raising awareness. Hopefully you didn't raise any blisters.